Choosing the perfect bedding can be confusing - and making the right choices can prove essential when it comes to getting a good night's sleep. That's why Christy have devised the Sheet Guide, to make it easier than ever to find the right bed linen for you, whatever your budget or preferences maybe. This plain dyed collection is made from a polycotton blend which is practical and yet easy to care for. Polycotton needs less ironing and is a little warmer to sleep under. The polyester adds extra strength to the fabric. The high quality percale fabric of 200 threads per square inch gives a fine, soft feel. Egyptian cotton, known the world over for its superior quality, is grown only in specific areas of the Nile delta where it has been cultivated for centuries. The high quality yarn is combined with a high thread count and a percale construction for a unique crisp, and clean feel with luxurious softness. Supima, the extra-long staple American cotton, produces one of the finest cotton yarns in the world. This luxurious bedlinen combines the natural benefits of Supima cotton with a high thread count and smooth sateen construction, for a beautifully indulgent sheet with a silky feel. The many different words used by bed linen and towel manufacturers can be a little overwhelming. The Christy fibre types glossary allows you to make sense of your bed linen and towels, and to make an informed purchase. In some bed linen, Christy have used blends of two fibres, for example cotton and linen. 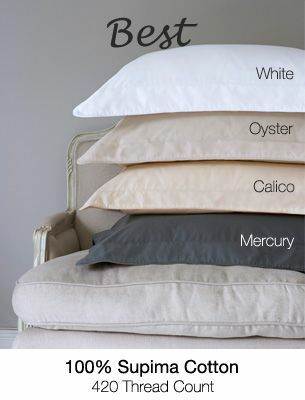 The combination of fibre types adds additional properties to the bed linen. Specific features within these fibres include slubs (or bumps) in linen and silk which are natural characteristics and add to the beauty of these fabrics. There are a variety of different cotton plants and each has their own traditional growing areas. The climate and growing conditions in each area produce cotton with different characteristics. The most important of these characteristics is the length and fineness of the individual fibres. The longer and finer the cotton fibre is, the softer, smoother and more lustrous (shiny) the yarn will be. 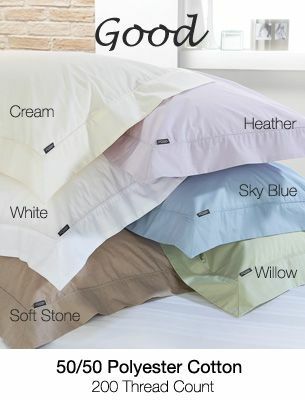 Percale is made from high quality cotton with a thread count of 180 or more. Percale bed linen looks matte and feels smooth to touch. 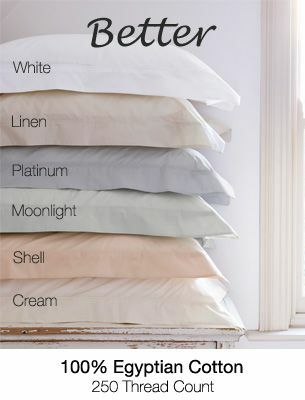 Percale launders beautifully is long lasting and durable, with less chance of pilling. Sateen is also generally made from combed cotton thread, which is woven in a different way, to produce bed linen with a sheen that feels luxuriously soft and smooth against the skin. As well as having a lovely feel and drapability, cotton sateen bed linen is easier to iron than cotton percale and will show colour better. Easy care is a finish added to cotton percale. This finish makes fabrics easier to wash and require less ironing. Easy care finishes do gradually wash out over time. Egyptian cotton, known the world over for its superior quality, is grown only in specific areas of the Nile delta in Egypt where it has been cultivated for centuries. GSM stands for "grams per square metre". It is the way weight is measured in a towel. The higher the GSM the thicker the towel. A higher GSM is associated with a more luxury towel. However if you were looking to purchase a towel for a busy household, where quick drying time is a priority, you may choose a lower GSM for a quicker drying time. Christy towel ranges that have a lower GSM are designed to give the same soft feel as a high GSM towel, but without the weight which increases the drying time of the towel. Pima cotton is an extra long staple U.S. cotton that is soft and absorbent and produces a soft fabric with similar properties to Egyptian Cotton. Pima cotton is technically slightly better than Egyptian Cotton but in practise the difference is small and the fabric choice often comes down to your own personal preference based on experience. Natural variations and slubs are unique characteristics of all types of silk fabric. Do not expose to direct sunlight. Colour variations may occur. Supima cotton produces one of the finest cotton yarns in the world with its extra long fibres giving a luxurious, silky handle. Supima cotton is a brand of cotton that is managed by Cotton USA ensuring a consistently high quality finish. With thanks to Christy for this fabulous information!